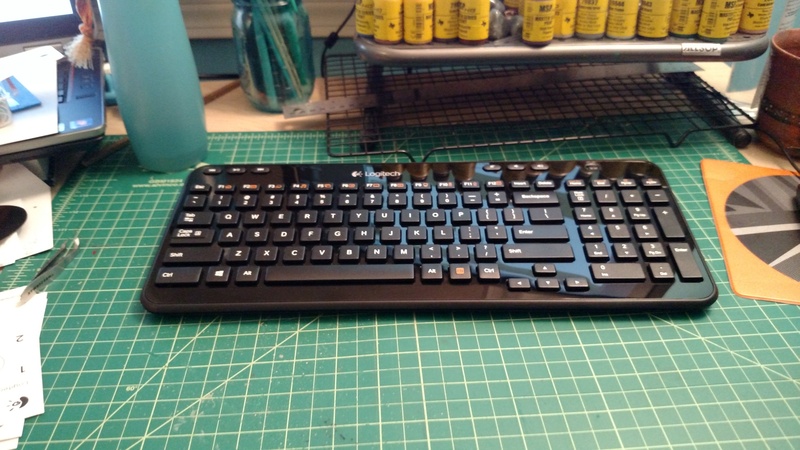 Thanks to my habit of painting and carving over my keyboard, it needed cleaning this morning. When I pried off the spacebar I snapped a bit of the plastic holding it properly in place, expediting my need for a new keyboard. I looked at my options, most of which were either way too big, way too expensive or just way too much until I found a reasonable shaped and sized wireless keyboard. It’s not quite full sized, which currently is a little bit of a pain, but it does have a full number pad which is important to me. Also it has chiclet keys like a laptop, which means that the larger pieces of dirt and such won’t get stuck in it. But more so, being smaller and wireless, I can put it away when I’m not using it! Previous yay calligraphy practice. Next Maple blunt end spoon? Spatula? Saute tool?